Bluff is located in the sparsely populated southeastern corner of Utah. It is a great base for historians who want to study the abundance of petroglyphs and ruins in the surrounding area. The Desert Rose Resort & Cabins is the most upscale place in Bluff. I’d say it is over priced at $100 when motel rooms in nearby towns rent for half that. Regardless, after a long day of travel, it works as a nice place to rest for the evening. While breakfast is not included, the Desert Rose Resort & Cabins is home to Duke’s which is open for breakfast and dinner. According to its menu, Duke’s serves new American Cuisine infused with Southwestern flavors. The menu features several choices ranging from salad to fish to steak. Vegetarians and meat eaters would both be satisfied. Bluff Fort is located in the center of town and is a convenient, free stop for historians. Bluff, Utah was established in 1880 when members of the Church of Jesus Christ Latter-Day Saints answered a calling to settle in the four-corners area. The early settlers traveled from southwestern Utah across inhospitable terrain via the Hole in the Rock Trail. The Hole in the Rock Foundation maintains Bluff Fort. The Bluff Fort includes a replica of the original co-op which houses the visitor center, a Ute Tepee, several cabins, a blacksmith shop, and even wagons used on the journey. The Sand Island Petroglyph Panel is located just over four miles west of Bluff off Hwy 191. The 100 yard panel of Anasazi Rock art can be found at the Bureau of Land Management Sand Island Recreation Area. The area is a popular launching place for river floats. It also includes a primitive campground. The panel is located on the north side of the park and protected by fencing. The rock wall features human figures, animals, and geometric patterns that date back thousands of years. In more recent times, the Navajos and Utes also recorded art here. The Moki Dugway is located about 30 miles west of Bluff. Let’s face it, in this part of Utah, that is close by! The dugway is a dirt road carved into the cliff’s edge of Cedar Mesa. It travels three-miles up steep and unpaved, though well graded switchbacks. The top affords lovely views of the Valley of Gods below. It is recommended that only vehicles less the 28 feet and 10,000 pounds attempt the drive up the dugway. The three-mile stretch of dirt switchback returns to a paved Highway 261 on top of the mesa. Continue following the road north to Highway 95. After about 30 miles, Mule Canyon Ruin will be located just off the highway. This commercialized area is easily accessible. The ruin is covered and interpretive signs explain its history. Just east of Mule Canyon Ruin and only about 40 miles from Bluff is The South Fork of Mule Canyon. Here, hikers can find eight different ruins. The first ruin, House of Fire, is about a mile down the canyon and the path turns right into it. The second ruin is about two miles down the path and requires scrambling up the slick rock cliffside. Two more ruins may be found between mile 2-3 and the rest are located in the last mile. All the ruins require some climbing, but it is fun to see them in a less commercialized setting. Another amazing hike for the historian is to the Butler Wash Indian Ruin. The trailhead is located just a few miles down the road from Mule Canyon South and is only about 37 miles from Bluff. The half mile trail leads hikers past juniper and pinyon before it turns to cross a rock slab marked with cairns. The path ends at the canyon’s edge for spectacular views of the extensive ruins. The cliff dwellings were built by the Anasazi’s 700 years ago. 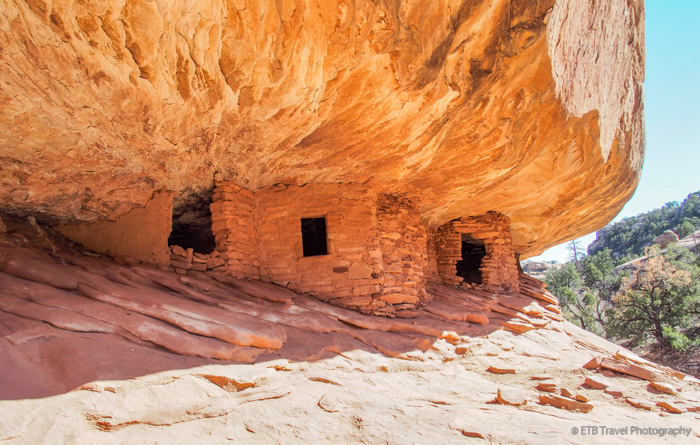 They include four kivas, storage areas, and underground ceremonial rooms. 100 feet above the canyon floor and several feet below the rim, I couldn’t help but wonder how the Anasazi established a community in this location. I was completely mesmerized by these cliff dwellings.